As chair of government’s justice, crime prevention and security cluster, Defence Minister Nosiviwe Mapisa-Nqakula maintains establishment of an integrated Border Management Authority (BMA) will improve border management at the country’s 72 legal points of entry and exit. Part of the cluster’s mandate, constitutionally, is to create conditions where all South African citizens “are and feel safe”. The establishment of the BMA is expected to be finalised this year, she told a media briefing in Pretoria on Sunday, adding it would ensure compliance with laws and the South African constitution by both citizens and foreign nationals taking “a whole of state” approach. This would apply to concerns raised by communities and promote better dialogue on policing between communities and authorities. In the only other mention of border protection, Mapisa-Nqakula said the SA National Defence Force (SANDF) continues to “play a pivotal role” in safeguarding the country’s borders. 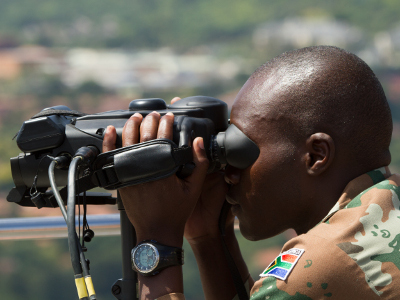 “The SANDF continues to be involved in government’s national security strategy and the imperative for security, as well as the fight against crime and corruption,” she said adding soldiers were deployed along on borders with six countries. The countries are Botswana, Lesotho, Mozambique, Namibia, Swaziland and Zimbabwe. She gave no detail of successes registered but defenceWeb has been told the first seven weeks of this year yielded contraband valued at over R2 million and more than 2 500 undocumented people were apprehended. Last year soldiers seized dagga and other contraband valued at more than R77 million from mostly illegals wanting to sell it in South Africa. There are currently 15 companies deployed on the border protection tasking, Operation Corona, with no extra funding provided in the Estimates of National Expenditure (ENE) to increase this number in the coming financial year. As far as terrorism and related activities are concerned, State Security Minister David Mahlobo is reported by SAnews as saying: “Joint operations of all intelligence community structures will continue as well as the sharing of information critical to countering any threats identified”. Mahlobo raised concern about the spread of fake news and scams. As such he said they are looking at the regulation of social media. “We are contemplating to regulate the space. Even the best democracies that are revered, they regulate the space,” Mahlobo said, acknowledging that this might interfere with human rights. As a result, there would be a lot of public consultation on the matter. Other plans for the cluster include reviewing the National Crime Prevention Strategy which was adopted in 1996. The review of the strategy, according to the cluster, will be to address new challenges that confront the criminal justice system, SANews reports. The cluster on Sunday also said that the overall crime in South Africa has decreased. Between 2015 and 2016‚ data shows a decrease of 2.1 million crimes reported in the 12 months measured. “We reiterate the call on all people and sectors in South Africa to join the fight against crime and corruption. The fight against crime cannot be separated from the need for transformation of the social and economic circumstances of our people by tackling the three challenges of unemployment, poverty and the unequal distribution of the country’s wealth,” Mapisa-Nqakula said. Attacks on foreign nationals dominated the briefing, especially with recent attacks in Johannesburg and Tshwane against those accused of involvement in illegal activities including drugs and prostitution. Minister Mapisa-Nqakula said the Inter-Ministerial Committee on Migration, is working on addressing the underlying causes of the tensions between communities and the foreign nationals. Some of the challenges that have been identified and being addressed are the strict implementation of labour relations policies as they pertain to foreign nationals; the implementation of the laws that govern business licenses; the country‘s border management and the country’s migration policies in general. A special team of detectives which deal with hijackings and robberies has been reinforced and communities have been urged to work closely with law enforcement agencies in this regard, the cluster said. Government is also intensifying the fight against drugs with the opening of seven public treatment facilities that are operational in Gauteng, KZN, Western Cape , Mpumalanga and Eastern Cape. “We have finished the building of three treatment centres in Limpopo and North West .Two other treatment facilities are currently being built in Free State and Northern Cape,” said Mapisa-Nqakula.